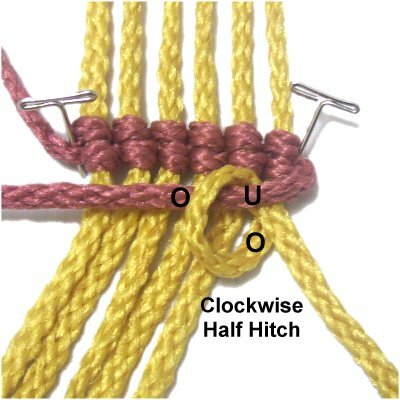 Description: The Vertical Half Hitch (VHH) is a unique variation of the Half Hitch. 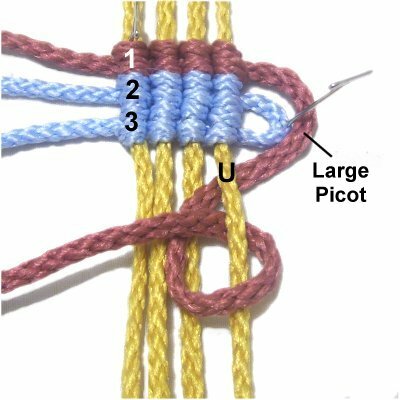 Since two knots are tied, it's often called the Vertical Double Half Hitch, especially in older Macrame books. 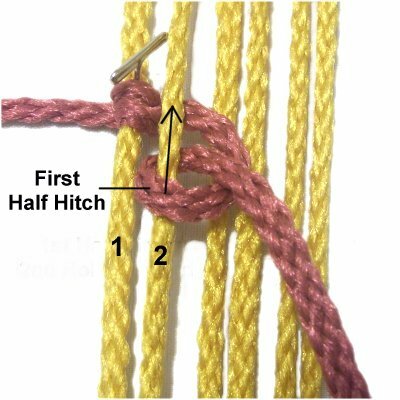 What makes it unique is that the two Half Hitches are arranged vertically, with the second Half Hitch resting in front of the first (below in images). In a regular DHH, the loops are side-by-side. 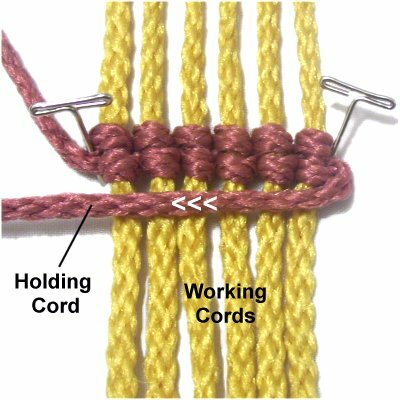 One working cord is used to tie the knots onto several holding cords. With the regular Double Half Hitch, it's the opposite: There are several working cords and usually one holding cord. 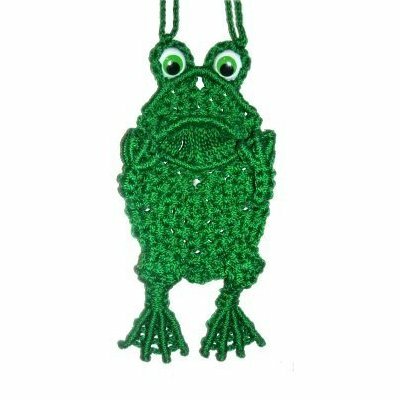 The Far Away Frog has webbed feet made with the Vertical Half Hitch. Click on the link if you wish to make this cute decoration. Step 1: Fold three holding cords in half and arrange them on your board vertically. Secure the cords at the top and bottom, pulling them so they have lots of tension and are straight. Secure a 36-inch working cord to the left of the others, arranged horizontally. Bring it under holding cord 1, and place a pin where you want the first knot to rest. Designer's Tip: To form a straight line, you can place a piece of masking tape across the board (horizontally or diagonally). When you tighten the knots, make sure they touch the edge of the tape. 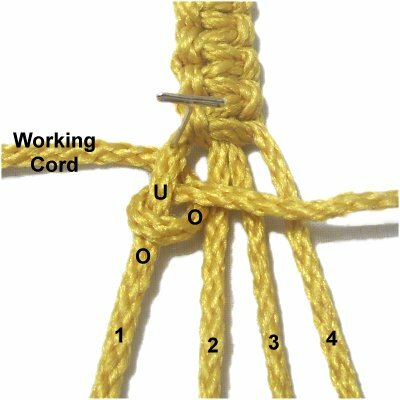 Step 2: Tie a clockwise Half Hitch by moving the working cord over - under holding cord 1. As you pull the working end to the right, pass it over the working cord. Tighten the Half Hitch firmly. Slide it up to rest against the pin. Step 3: Repeat step 2, tying a second Half Hitch next to the first one. Tighten this knot firmly while making sure the first one doesn't loosen. Step 4: Move the working end under holding cord 2. Step 5: Repeat step 2, tying a Vertical Half Hitch onto holding cord 2. 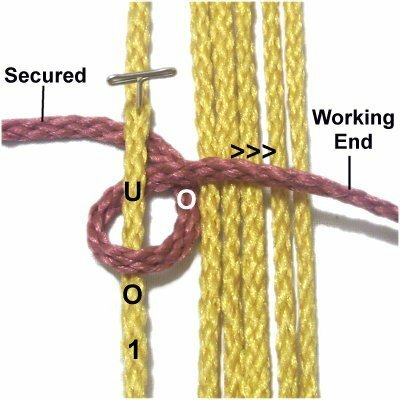 As you tighten it, move the knot back so it rests very close to the knots previously tied. 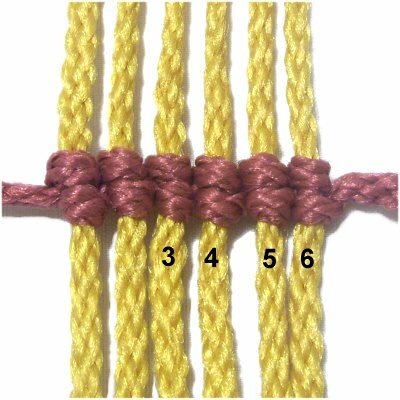 Tie the second Half Hitch next to the first, as you did in step 3. Designer's Tip: The most challenging part to this design is making sure the knots rest close together. 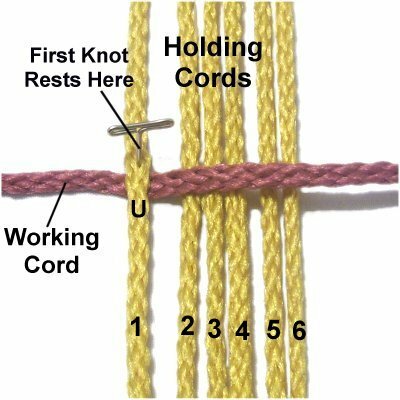 You should pull (or push) the holding cord you are using towards the one holding the previous knot, while tightening both Half Hitches. 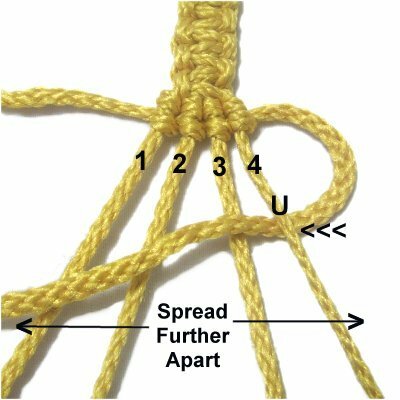 Make sure the FIRST Half Hitch in each pair remains tight as you construct and tighten the second knot. Step 6: Continue repeating the same process, tying two Vertical Half Hitches onto holding cords 3 - 6. Step 7: Some Macrame patterns require you to reverse direction, so you should practice that now. Bring the working cord under holding cord 6. Step 8: Tie the Half Hitches counter-clockwise, so the working end is heading left. 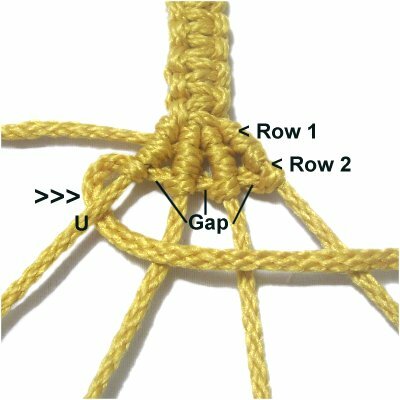 Move the first Half Hitch before tightening, so it rests against the knots in the previous row. 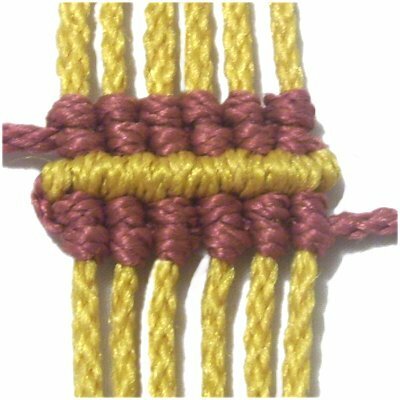 Designer's Tip: Vertical Half Hitch designs can be made diagonally. Just position the knots so they have a gradual downward slant. Placing a piece of tape as a guide really helps. 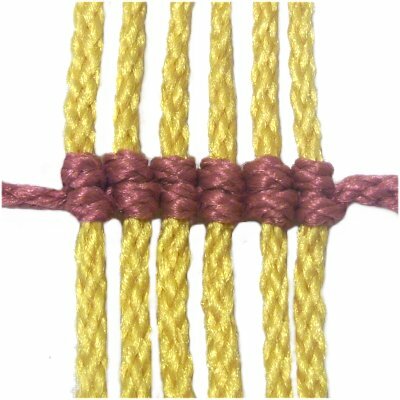 Many Macrame designs feature both the regular Double Half Hitch as well as the Vertical Half Hitch. By using both variations, elaborate designs can be made where the colors shift back and forth. Step 1: Tie a row of Vertical DHH moving left to right, as described in steps 1 - 5 of the basic instructions above. Move the working cord back to the left, horizontally. It will now be used as a holding cord. Step 2: Tie a row of Double Half Hitches with the vertical cords onto the new holding cord, beginning with the cord furthest to the right. They should be clockwise, since you are moving right to left. Make sure the knots in the second row are touching the knots in the first row, so there are no gaps. Tighten all the Half Hitches really well, so the row looks neat. Designer's Tip: When switching between two colors like this, just remember that the working cords determine the color for that row. The holding cord will not be seen, since the knots cover it. Practice switching colors again, by repeating step 1, followed by 2 (optional). Ever wonder how Webbed Feet for Frogs and Birds are made? 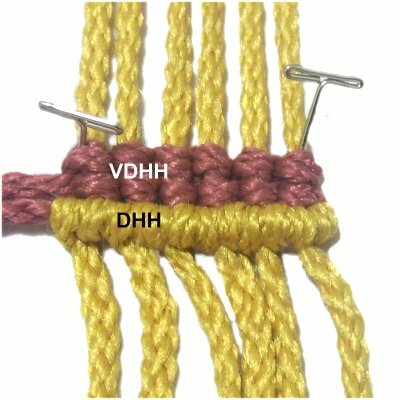 You use the Vertical Half Hitch, positioning the holding cords further apart as you complete each row. 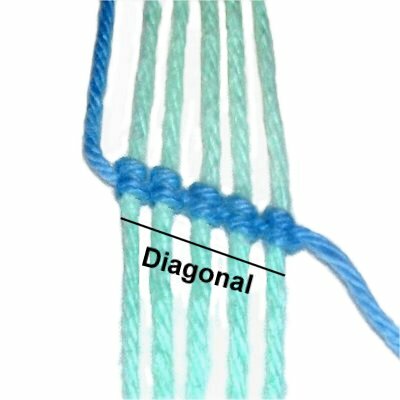 You can also make fans and other triangular designs with this technique. Step 1: Fold two 36-inch cords in half, and secure them at the center. 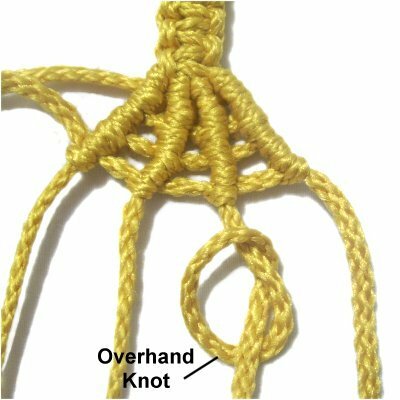 Tie several Square Knots to mimic the legs of a bird or frog. Secure the four cords with tension, since they are the holding cords for the foot. Step 2: Secure a 36-inch working cord to the left of the holding cords. Mentally number the holding cords. Tie a Vertical Half Hitch with the working cord, onto holding cord 1. 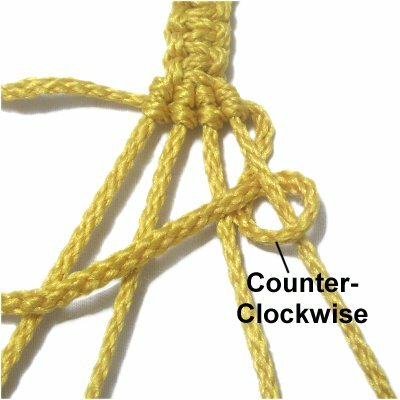 The Half Hitch should be tied clockwise, since you are moving left to right. Step 3: Complete the first row of Vertical Half Hitches as described in the basic instructions (steps 4 - 6). The knots should rest close together with no gap between them. 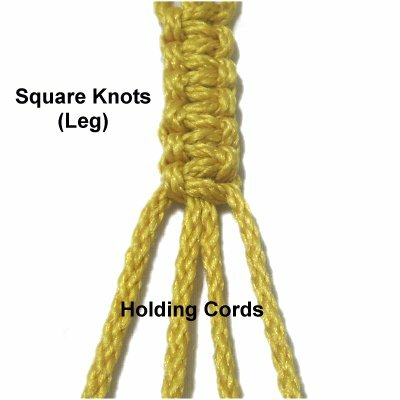 Slide the knots back, so they rest against the Square Knot at the bottom of the leg. Spread the holding cords further apart. Move the working cord back towards the left, passing under holding cord 4. Designer's Tip: The knots on the holding cords are the "toes" for the foot. The webbing between the toes is made by moving the holding cords further and further apart. Step 4: Tie the 2nd row of Vertical Half Hitches starting with Holding cord 4, and ending with cord 1. There should be a gap between the holding cords, so you can see the working cord (next image). Since you are moving right to left, the Half Hitches are tied counter-clockwise. Step 5: Spread the holding cords further apart. 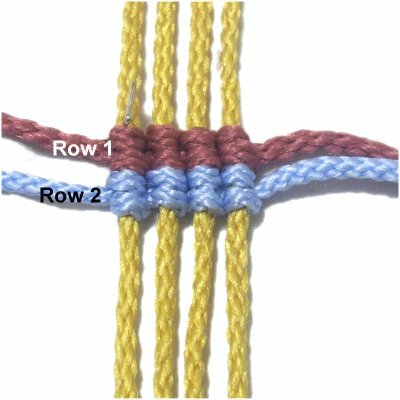 Tie the 3rd row moving left to right, and tying the knots clockwise. Spread the holding cords again, and tie the 4th row moving right to left. 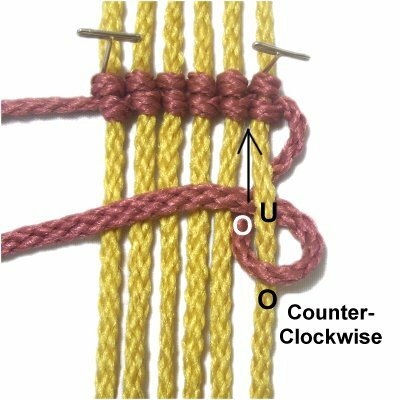 The knots should be tied counter-clockwise. Step 6: Most Macrame patterns will have you tie Overhand Knots or Barrel Knots with the holding cords, to prevent the knots from sliding down. They should rest against the last row of Half Hitches. Apply glue before cutting off the extra material. 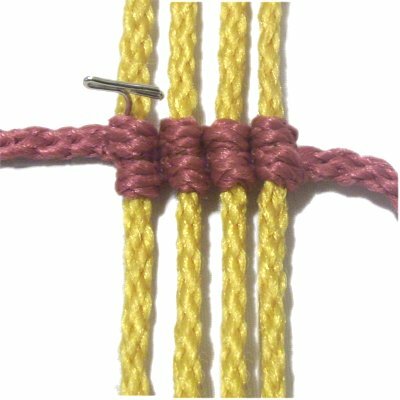 This Vertical Half Hitch technique features two sizes of picots on each edge. It was found in an old Macrame book written in 1903. Secure 4 holding cords vertically on your board, so they have tension and are straight. Cut two 36-inch working cords as well, preferably two different colors. Step 1: Tie the first row of Half Hitches moving left to right, using one of the working cords (Steps 1 - 6 of the basic instructions). 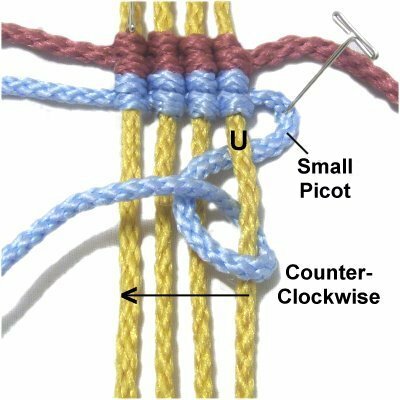 The knots are tied clockwise. 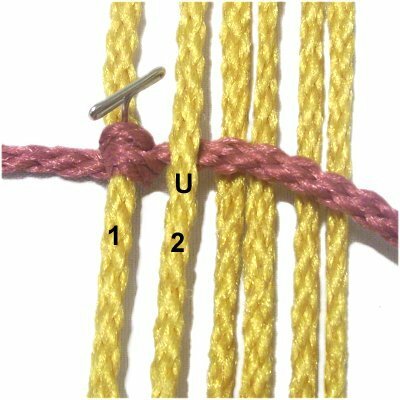 Step 2: Tie the second row of knots using the other working cord. Move left to right, as you did in step 1. Step 3: To start row 3, move the cord used in step 2 under the 4th holding cord. Secure a small portion to the right, forming a small picot loop. Tie counter-clockwise Half Hitches onto holding cords 4 - 1 (right to left). Step 4: Start row 4 by moving the working cord used in row 1 around the pin holding the small picot loop. Pass it under holding cord 4, then tie the Half Hitches. Tie the remaining knots onto the other holding cords. Step 5: Start row 5 by moving the working cord used in row 4 under holding cord 1. 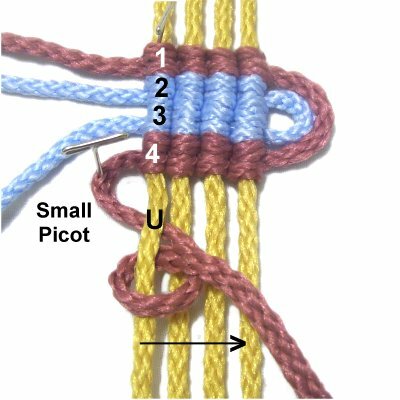 Secure a small portion to the left to form a small picot loop. Tie clockwise Vertical Half Hitches on cords 1 - 4 (left to right). 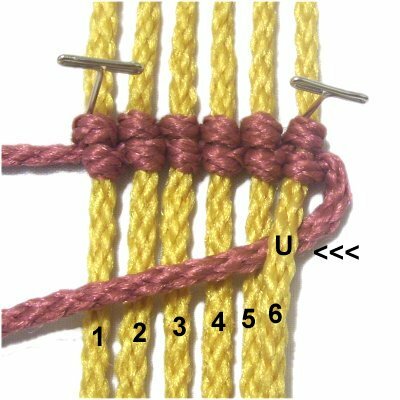 Step 6: Row 6 is made with the working cord used in row 3. Move it around the pin holding the picot from the previous step. Pass it under cord 1, then tie the Half Hitches. Repeat with the other holding cords. 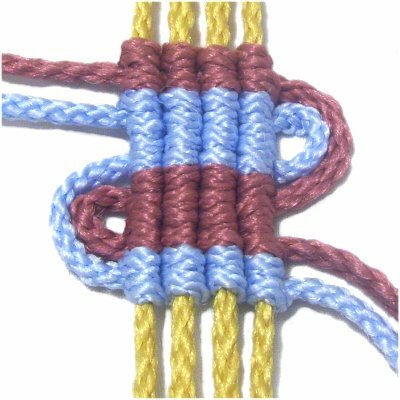 Designer's Tip: The key to this Vertical Half Hitch design is to tie two rows with each color, alternating the direction every other row. 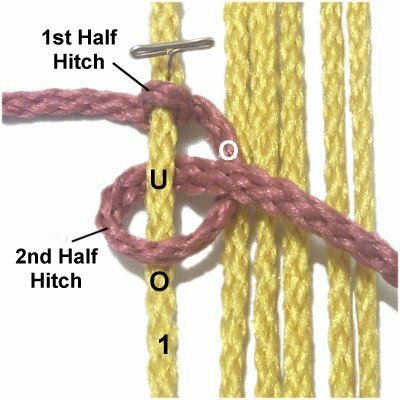 Have any comments about the Vertical Half Hitch? Contact Me.